Our religious habit is an outward sign of our consecration to Jesus in the mystery of His Passion and death. It consists of a simple, long black tunic, pleated at the waist by a leather belt from which hangs the rosary of Our Blessed Mother. Over our hearts we wear the Passion Sign which sums up the basic elements of our Passionist spirituality. We wear a simple coif under our black veil. Novices wear a white veil and the black tunic. Only after first vows do they have the privilege of wearing the Passion Sign. We also receive a ring at first Profession, signifying that we are the Bride of Christ. We ordinarily wear sandals, although shoes are permitted not only for Nuns with foot problems but also for those who work in the garden or who like to do brisk walking outdoors. Passionist Nuns have never had a long scapular as part of our habit, nor the “guimpe” as part of our head gear. Because there is very little material used in making our simple habits, this is one form of our poverty. We do not own individual coats, jackets or boots. There are several common coat closets in the monastery where coats of various sizes are hung. A Sister goes there to get a coat when she needs one. Our monastery has adopted a white collar which helps to keep the habit clean. Other Passionist monasteries—especially those who bake altar breads—allow grey, white or blue work habits. We cherish our Passionist habit and wear it even in playing outdoor games or bicycling. Aprons of various colors, shapes and sizes can provide ingenious ways of preventing a tumble during these games. Nuns are usually very creative! It is wonderful to wear a religious habit! It liberates you from the tyranny of modern fads, and keeps you aware that you belong to Christ. There is so much interior freedom in not having to think about what to wear for this or that occasion. The habit is truly what it says: your habitual attire. There is also this wonderful quote from the bible: “Serve the Lord in holy attire.” (1 Chronicles 16:29) Because the religious habit is blessed, it is a sacramental that brings grace to the one wearing it as well as to those who see the religious. (Handing the habit): Receive, dear Sister, this holy garment of the Passion, by which you will proclaim to the world your desire to follow Jesus Crucified in Passionist life. (Handing the veil): Receive this white veil of a bride of Christ. May it daily remind you to be docile to your Passionist formation as you prepare for the day when you commit yourself to Jesus Crucified by vow. (Handing the belt): May this belt remind you of the chains and ropes of your suffering Spouse so that you may desire to be bound to Him by the bonds of love. (Handing the rosary): May this rosary remind you of your vocation to stand with Our Mother of Sorrows beneath the cross of her Son. Sister, as you put on our holy habit, may you cherish in your heart the desire to put on the mind of Jesus who humbled Himself and took the form of a slave, becoming obedient even to death on a cross. At first Profession of Vows, we receive the black veil, the Passion Sign, and our Passionist ring. It is a great privilege to wear over our hearts the insignia of the holy Name of Jesus, and the sign of His Passion. 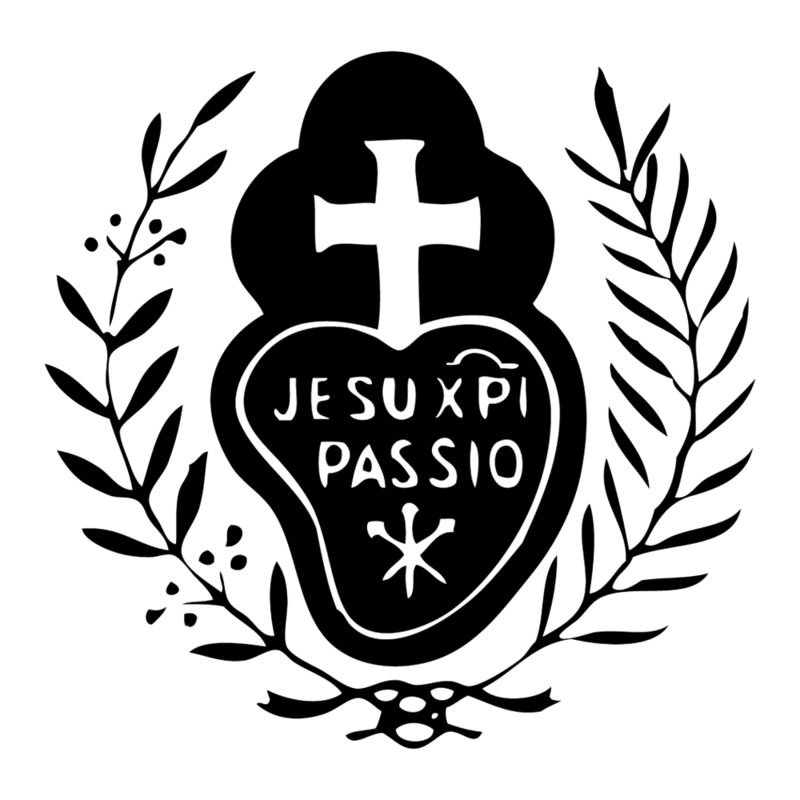 This Passionist emblem is characteristic of all who belong to the worldwide Passionist family—priests, brothers, cloistered nuns, active religious, missionary societies and lay Passionists. Engraven inside a heart are the words Jesu XPI Passio, which mean "the Passion of Jesus Christ." Three nails are crossed at the bottom, while a large white cross is mounted at the top. "...On a certain weekday in the Capuchin church in Castellazzo, I received Holy Communion with a deep sense of my unworthiness. I remember that I was deeply recollected, and then I left to go home. Walking along the street, I was as recollected as if I were at prayer. When I came to a street corner to turn toward home, I was raised up in God in the deepest interior peace. At that moment I saw myself clothed in a long black garment with a white cross on my breast, and below the cross the Holy Name of Jesus was written in white letters. At that instant I heard these words spoken to me: ‘This signifies how pure and spotless that heart should be which must bear the Holy Name of Jesus graven upon it.’ On seeing and hearing this I began to weep, and then it stopped. Shortly afterward I saw in spirit the tunic presented to me with the Holy Name of Jesus and the cross all in white, but the tunic was black. I pressed it joyfully to my heart." #430 - Jesus means in Hebrew: "God saves." At the annunciation the angel Gabriel gave him the name Jesus as his proper name, which expresses both his identity and his mission. Since God alone can forgive sins, it is God who in Jesus his eternal Son made man, "will save his people from their sins." #432 - The name "Jesus" signifies that the very name of God is present in the person of his Son. #435 - The name of Jesus is at the heart of Christian prayer. #2666 - The one name that contains everything is the one that the Son of God received at his incarnation: JESUS. To pray "Jesus" is to invoke him and to call him within us. His name is the only one that contains the presence it signifies." #2668 - The invocation of the holy name of Jesus is the simplest way of praying always. The Passionist emblem sums up our Passionist spirituality, and can be pondered in many ways. One way is as follows: a heart is pictured beneath a cross because Passionists dwell in spirit with Mary beneath the cross of Jesus, pondering the love He showed us and the meaning of His Paschal Mystery. The words, "the Passion of Jesus Christ" written inside the heart proclaim that we so desire to keep in mind that Jesus Christ has laid down His life for us, that this memory becomes, as it were, engraven deeply into our hearts and is expressed in our lives. As we say elsewhere on our website—our devotion to the Passion of Jesus is actually very "Marian," for who more than Our Blessed Mother could have loved Him more, shared His sufferings with Him more faithfully, or treasured more constantly the loving memories of Jesus impressed upon her heart? This rich spirituality is expressed by our Passionist habit. Vocation Retreat in Two Weeks!